We have a problem, folks. I had to take time to mention it. I know that most days I'm blogging about pretty unimportant stuff. Sure, crafting and cooking is entertaining. Entertainment is important and most certainly has its value. But every once in a while I have to take a time out from the silliness and talk about something real and much more important. This past Sunday night I watched the Oscars, as I do every year. I consider it my 'Superbowl.' I love the dresses, the style, the excitement and glamour. But something bothered me so much about the Oscars I couldn't stop thinking about it. Too many of the women are sickly thin and they are sending a very seriously damaging message to our young girls. I first was taken aback when I saw Rose Byrne. She was incredible in Bridesmaids - but her bony frame is not incredible. If the camera adds 10 pounds, I don't want to see her in person. I was next horrified when Angelina presented an award. The size of her head compared to that of her body is completely unbalanced. Her arms appear to be bone and skin. That's all. What I find most troubling that these two women are such a small part of a huge epidemic. The entire red carpet at the Oscars or any other Hollywood event are littered with shrinking starlets. Angelina Jolie is an incredible humanitarian. I applaud her for work worldwide. But about the little girls here in America? As they grow up and are bombarded with so many images of frail, unhealthy looking women being tauted as beautiful, what will they think of themselves? Worse than that, what will they do to obtain the same looks? I have a beautiful nine year old cousin who looks up to 'big girls' like my sister and I as well as other women with all of her heart. Some of my best friends have new baby girls of their own. I worry so much that they will feel pressured to starve themselves in order to feel beautiful like the Hollywood women. I don't know. I'm not sure any of my actions will cause any change in Hollywood. But I will be able to control what I do in my life. I hope that if I ever have a daughter I will be a healthy role model for her. I will always strive to surround her with strong, incredible women who make choices worthy of being called a role model. I will talk to her about all of these things, then hold my breath and hope that I did enough as she goes into the world on her own. 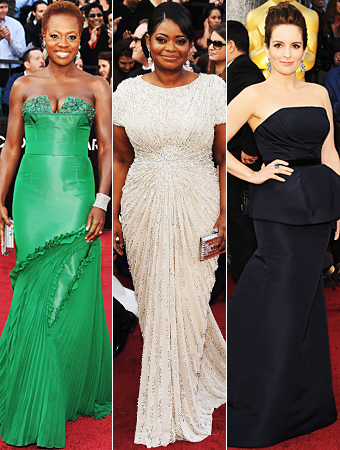 I would like to say that not all of the women at the Oscars looked like the hadn't eaten. These few women represent what real American women look like. Hopefully we can see more of this in the future. I was so proud of the rel women like Melissa McCarthy and Octavia spencer, I didn't even notice the skinny girls. I have a daughter, whom happens to be very thin, but I am not. We have one rule about food, when you are hungry, you eat and if you are not hungry, you don't. We teach our children that we all come in different shoes and sizes. I have also come to understand that some girls are just blessed. I have a niece who literally eats all the time, but seems to be skinnier every time I see her, which is almost daily. She is just blessed with the right metabolism for her. We are all blessed in different ways, I wouldn't trade anything in my life to be thin. Healthy is all that matters in our little family. I might not be thin, but I have great hair and nails:). Lol. Thanks ash! Love you! Health is very important! Thank you for sharing. Thank you for reading!